Real time power monitoring and load control software for Ontario Industry. To begin managing your power use, you’ll need information from your main electricity meter(s) to be connected to the Energy Advisor Software. This allows for the display of electricity usage information on a minute by minute basis. Want to reduce load when the price is high, or when required by the IESO Demand Response Program or based on IESO dispatch signals? Choose the electrical loads that are best suited for reduction or power down when the need arises and let our system notify you when you need to reduce load or do so automatically by creating an automated load shedding strategy. Grow the system as new needs and opportunities arise by adding additional metering and sub-metering points to create cost centres or add additional Software modules. We designed the Energy Advisor Software to be modular and expandable so it can grow with you as your needs require. Our system will meet your needs today and well into the future. Contact us to get started quickly and affordably. The Energy Advisor starts with the Core System. This is the backbone that collects utility metering data from meters and data base sources and then processes the information and stores it in the Energy Advisor database. The Core System has been proven reliable and is currently in use by leading manufacturers, mining organizations, foundries and commercial facilities. The core system operates 24/7 using resources on an existing server or a dedicated computer system, it’s also self monitoring to ensure reliability. Improving efficiency and achieving savings means taking action when opportunities to do so are identified. Our powerful targeting and control system allows you to set usage targets and then take action either manually through notifications or automatically using our sophisticated configurable control system. Whether you want to control load to achieve specific demand and/or usage targets or to curtail load based on electricity market conditions/pricing/dispatch or demand response, the Energy Advisor Software has you covered. Over the years you’ve probably invested in a variety of technology to collect, monitor and report on Utility consumption data. That’s why we offer an unprecedented capability to incorporate existing third party data into the Energy Advisor Software. If you have utility data in a database, chances are we can incorporate it into the system. For the sophisticated customer who employs Distributed Control System technology to run their processes, we also offer the ability to send data, notifications and alerts to these systems using OPC connectivity. A variety of modules are available for the Energy Advisor Software, including Utility Bill verification, demand response and electricity price tracking. 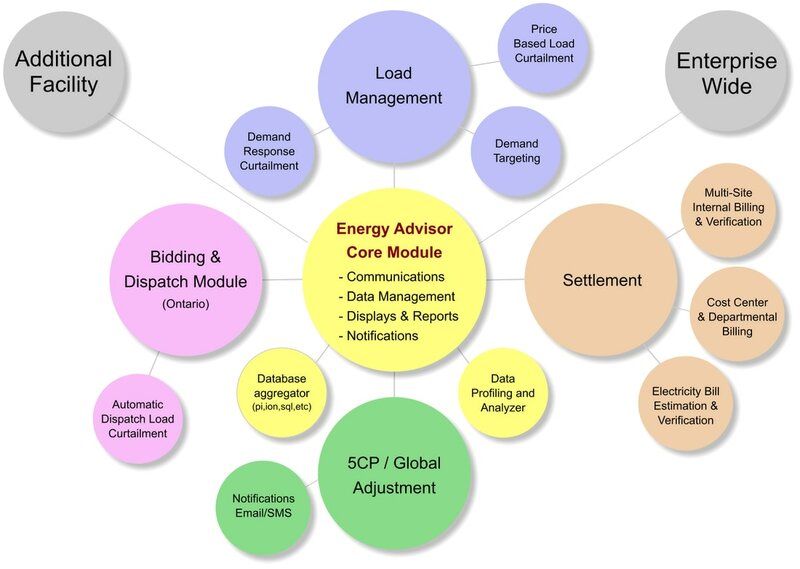 Additional modules that address the needs of customers in specific markets include Dispatch & Bidding, Power Distribution System Coincident Peak Avoidance ( Global Adjustment Peaks or 5CP ) and other options. The Energy Advisor Software is self monitoring and supported via secure remote online connection from our central technical support centre. Not only does our support team check your system on a regular basis, we are also able to respond quickly and effectively to any problems due to the self monitoring features of the system.